New Delhi: Increasing the acreage of wet crops like rice -- and also increasing the watering structures in areas that already have wet crops -- appear to be helping the sarus crane's unseasonal nesting and also their multiplication.This fact came to light in a first-of-its-kind study by Indian ornithologists, who monitored close to 1,000 breeding pairs in Uttar Pradesh, Gujarat, Rajasthan and Haryana over a decade. Gujarat and Rajasthan are states in which wet crops have increased relatively recently, to the extent that two rice crops are harvested in some districts. 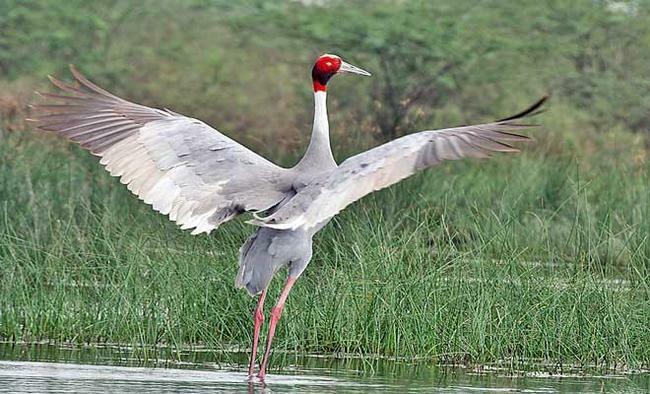 The sarus cranes in both the states appear to be trying to make the best of the situation by multiplying even if there is an erratic monsoon -- or it fails. "Unseasonal nesting is only done by sarus pairs that were not successful in raising chicks in the main monsoon season," Mysuru-based Nature Conservation Foundation scientist K.S. Gopi Sundar told IANS in an interview. "So it appears to be a strategy to try to raise a brood even outside of the normal nesting season in places where conditions become conducive," said Sundar, also the Director of Programme SarusScape for the International Crane Foundation. These findings of Sundar and his co-ornithologists Yaseen Mohammed from Rajasthan and Kandarp Kathju from Gujarat have been published in the latest edition of the Waterbirds journal.The paper says changes in rainfall patterns are clearly very important for the sarus' new breeding pattern -- several unseasonal nests were found in years when rainfall extended beyond the "normal" October and in years when rainfall volume was much higher than the decadal mean. However, unseasonal nesting was not observed in Nepal, also part of the study.Uttar Pradesh, home to the largest global population of the breeding sarus, is also the place in which the cranes have found a conducive environment for the longest time.Gujarat is next in terms of numbers followed by Rajasthan, while Haryana has relatively few breeding sarus pairs. The reason for this is a mix of climatic conditions -- arid and semi-arid states have fewer sarus -- and changes in cropping patterns, Sundar explained.Irrigated rice has been present in Uttar Pradesh since the times of the British, while it is relatively new in many parts of other states.This has partly been responsible for the current breeding populations of the sarus cranes. Sundar said a vast majority of breeding pairs still nest during the monsoon.So when dry years increase, or in the years when the monsoon falls over a smaller period of time, the sarus crane is put at risk. "This is particularly true since our study found unseasonal nesting to be a very, very small proportion of the total breeding effort, i.e., 0.3 per cent of 5,000 breeding events," he said. The sarus crane is an unusual species in having adjusted to areas with a lot of farming. This is at variance with the global situation where bird species generally decline in such areas.The reasons for this are quite complex, but the major assistance the sarus gets is from farmers, whose favourable attitude towards the species helps enormously.Even if they do not make specific interventions such as improving habitats, just not hunting the bird can be a great advantage, Sundar said. Still, threats exist for the tallest flying bird that largely depends on healthy wetlands, besides agricultural fields.The biggest threat by far is the expansion of urban and semi-urban areas that are eating into wetlands, marshes, open lands, grasslands and even agricultural lands, he said.This permanently displaces breeding pairs and directly threatens the long-term viability of local populations. The other threats include poisoning, mortality due to collision with electricity wires and death of unfledged young birds due to predation by an increasing population of dogs.During the study, the ornithologists also found the sarus crane in lowland Nepal, Madhya Pradesh, Maharashtra and Jharkhand; there were also small populations in Punjab and Himachal Pradesh.Their conservation is tied directly to cropping practices, and not to species-based planning. "Fortunately, India is monsoonal -- which means that flooded rice fields will remain a part of the farmed landscape in many areas where the sarus abound," Sundar added.The sarus cranes are rarely seen in Pakistan, and a couple of pairs used to reside in southern China but have not been seen for a while. Populations also occur in Southeast Asia and Australia.